Academic learning is about gaining new knowledge and skill, but only recently has it been possible to see new knowledge appear in a human brain. "These new discoveries about the neuroscience of learning open the possibility of informing and enhancing instructional methods in science," said Marcel Just, the D.O. Hebb University Professor of Psychology at CMU's Dietrich College of Humanities and Social Sciences. For the study, Just and co-author Timothy Keller, adjunct professor of psychology, taught college students who were not chemistry majors the names and molecular structure of nine organic compounds, including ethanol, while the students were in an MRI scanner. 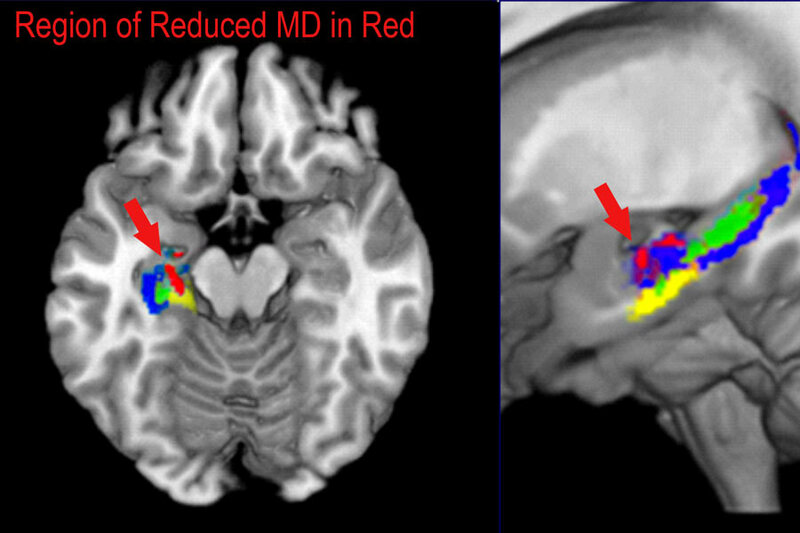 Pictured above: The region of left hippocampus in red shows decreased mean diffusivity (MD) after learning. The following hippocampal subregions are shown: Cornu Ammonis (CA) in blue; dentate gyrus in green, and subiculum in yellow.